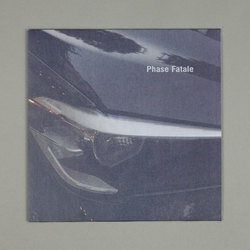 Phase Fatale - Reverse Fall. Vinyl 12. Bleep. Over the past four years, Hayden Payne aka Phase Fatale has earned a reputation as a techno innovator, both for the broad spectrum of dystopian electronics included in DJ sets as well as his deep understanding of synthesis and sound design in his own productions. Having previously released on labels such as Jealous God, Payne made his Unterton debut with last year’s Anubis EP. Since then he has settled into residences at both Berghain in Berlin and Khidi in Tbilisi, released his first LP on Hospital Productions and kicked off his own label BITE with a collaborative EP between himself and Silent Servant. On his debut 4-track EP for Ostgut Ton, Reverse Fall, The New York native has sharpened the rhythmic contours of his productions, creating an imposing wall of sound within the techno framework. Inspired in part by Crash, J.G. Ballard's dystopian novel on the fetishization of car crashes, Reverse Fall is uncompromising motorized, cybernetic techno – infused with haunting soundtrack-like flourishes reminiscent of films by directors John Carpenter and Dario Argento. The night drive is audible from the get-go on the EP’s title track, accelerating and swerving at the pace of a dark, melodic bassline and distorted hi-hats. From there, the lumbering tempo, drone and teeth chattering sonics on “Incision” (A2) suggest twisted wreckage. “Blackbox” (B1) picks up the speed with whip-crack snares, rim shots and bursts of distortion, while EP closer, “Empty Whip” (B2) offers a more spacious groove, where staccato synth lines flash across the stereo image, punctuated by the sounds of metal-on-metal. While Reverse Fall is a slight departure from Payne’s previous releases in its concentrated focus on techno, it’s this focus that is also the EP’s motor.